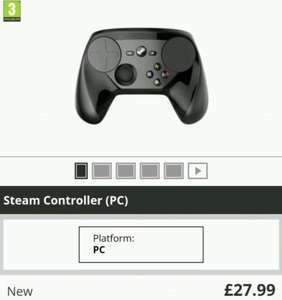 Just saw that Steam have the Steam Controller in their sale for £27.99, got to checkout and noticed that they don't give free delivery... Tut tut... Popped over to Game only to find its the same price but with Free Delivery! I suspect this is cold as the controller has received very mixed reception. I paid full price and really tried with it, but my x1 controller is easier to use. Awful pad, couldn't get used to it at all. loads of other pads are compatible with steam link. Disgraceful to see people voting cold because of their opinion of the device. This is the cheapest price out there. Yes, I found the offer now as well... came to post it, and see it's cold?! It's the cheapest price I've ever seen, strange regarding the votes! Yes, I found the offer now as well... came to post it, and see it's cold?! …Yes, I found the offer now as well... came to post it, and see it's cold?! It's the cheapest price I've ever seen, strange regarding the votes! Is it as bad as people say? I think it's just individual preference. I used to have Logitech F710 which was pretty good. Now I want to replace it and try something different like this one. Is it as bad as people say? I think it's just individual preference. I …Is it as bad as people say? I think it's just individual preference. I used to have Logitech F710 which was pretty good. Now I want to replace it and try something different like this one. It's actually surprisingly decent in my opinion, I got one recently hence posting this deal... I think for the right game it's good, I use an Xbox One controller for other games like Forza Horizon 3 and Assassin's Creed Syndicate etc, I don't expect I'd have the same sort of feel using the Steam Controller for them but I got the Steam Controller with SWAT 4 on my laptop in mind and to be honest it's absolutely spot on! I saw this post the same day that I was thinking about buying a Steam Controller and hold off due to the negative rating in the deal, ie, I thought it meant it was a bad deal and it was usually offered at a better price. On a different note, does this controller has some kind of vibration feedback? eg, for racing games when there are crashes, bumps in the road, etc?